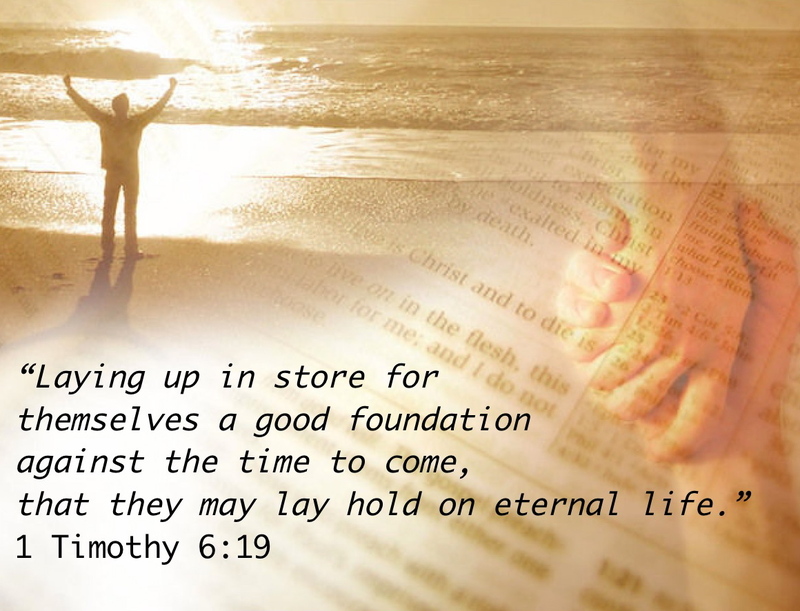 Laying Hold of Eternal Life – God's Grace ~ God's Glory! Living in a world of oblivion we see and experience life that is out of focus with true life. By reading God’s Word we see the life that God meant for us to live. At the same time we realize that it is more than man is able to do. His commands are not just requests, but what He expects from what He has made as His own. As humans created to bear His image He has proved that we are unable to be His image-bearers. Every creature, since the beginning, has failed the test. God’s righteousness is beyond the scale of any human being who walks the face of the earth and breathes the air that He created and sustains for us. He knew this beforehand, and so did not leave us hopeless in our oblivion. Andrew Murray, in his book Waiting on God, states that God’s commands are what He promises to do. With this in mind let us look at how He enables us to lay hold on eternal life, not just for the time to come, but for a clear vision of this life on earth now. We can understand this laying hold through four means; appropriation, procurement, apprehension, and approbation. This are relative to how we obtain and hold possession of the physical things that we own; and so we can apply them here. Appropriation is “something set aside for a particular use.” Even as governments or businesses plan for certain projects, we lay aside money for what we want to purchase. Before time began God made plans, in covenant with His Son, Jesus Christ, for our redemption. In the fullness of time, according to the Father’s will, Jesus was born, becoming one of us. The covenant was ratified when Jesus died. “It is finished” was His proclamation for the procurement of those to whom He would give new life. But, how would we know; and so lay hold? To procure means to “obtain.” Synonyms are to “get” “lay hold of” “acquire” “secure” and “buy.” Procurement is “the action of obtaining or procuring something.” Eternal life is not only off our scale of experiencing, and understanding, because of our oblivious state; but beyond our obtaining. We can buy almost anything we want in this world, except another life. This life is the only one we have, and is daily wasting away. Without help we will eventually die, and then eternity will no longer be an oblivious state, but a reality of what life is without God, for those who did not “against the time to come, lay hold of eternal life.” It is not that we are able to buy another life, but that the procurement is God’s deal, so to speak. He wants His people for Himself. He made provisions and plans for the purchase of His people. With the life and blood of Christ, without our knowing, or our consent He bought us, as His sons and daughters. The word apprehension has two meanings, “anxiety” is not the one we refer to, but the second, which is “capture.” Like sheep we continue in oblivion until the Holy Spirit shines the light into our hearts of the knowledge of the glory of God in the face of Jesus Christ. We will never find our way to God, but by His drawing us to Christ (John 6:44-45) or finding us in our sin and misery reveals our condition and need for Him. From the beginning He always knows where we are and will pursue until He lays hold of us. 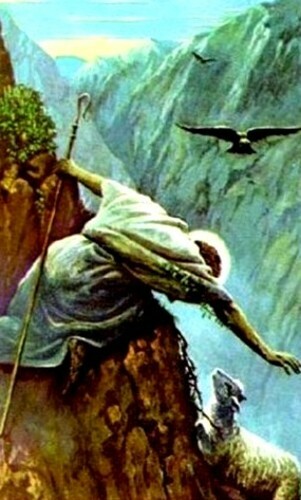 The Shepherd looks for His sheep until He finds them and brings them into His fold. Can we refuse His care? Not in the condition that He finds us. He apprehends in exactly the time of His choosing, when we are helpless and hopeless, seeing ourselves as we are, in need of a shepherd. He then opens our eyes to see Him as He is, the giver of life. Dear Father, having nothing of our own, but what you planned for us before time began, we praise you. By the same power that you apprehended us, let us live with thankful hearts in obedience of faith. Let that light that you shined into our hearts shine through us that others may see what is true life. In Jesus’ name I pray. Amen.